Been a dull summer filled with all work and no play around here. I’ve snuck in a few short local hikes when I could, but No big trips around the state to report about. Will be trying to rectify that soon, and maybe some of these events will help! REI has plans to open a few stores in the NY/NJ area in the next year, and August 26-27, 2011 will see the grand opening of their store in Paramus, NJ. Giveaways, t-shirts, and other goodies will be given out, as well as a chance to check out all the shiny new gear. REI Paramus store details. Not to be left out, REI’s stores in East Hanover and Marlton offer gear demos and other instruction (GPS, hiking, backpacking, cycling) both in store and on location in local parks and rivers. 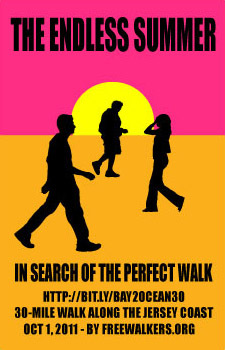 The long distance walking group the Freewalkers (see Lenape Trail Hike Report) are back with another great event—a one day, 30 mile walk along the Jersey Coast from Keyport to Asbury Park on October 1, 2011. The trip goes through some great shore towns and trails around Monmouth County and Sandy Hook. Like past walks, check the schedule for points along the way to start or leave the group if you don’t think you can make the whole distance. Bay2Ocean30 / Endless Summer Walk web site. BaseCamp Adventure Outfitters, an outdoor gear outfitter located in Bernardsville, offers weekly group hikes around Morris County and surrounding parks. Upcoming hikes include Lewis Morris Park on 8/23, Hackelbarney State Park on 8/30, and Turkey Mountain on 9/12. BC Upcoming Hikes Listing. Relayed from the New York-New Jersey Trail Conference newsletter, the 12th Annual Hudson River Valley Ramble starts September 10th with hiking and historical events all month, and up and down the Hudson from NYC to Saratoga. Did I miss anything of note? Got an event you want to share? Post away in the comments! This entry was posted in Event and tagged bay2ocean30, events, freewalkers, hudson river, monmouth county, Morris County, REI, store opening. Bookmark the permalink.